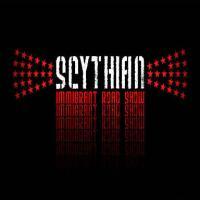 October 26, 2007 - CelticRadio.net - Scythian (sith-ee-yin) is a young Celtic band of four self-proclaimed "twenty-somethings" based in the D.C. metro area. A charismatic group comprised of brothers and friends, Scythian's music ranges from traditional folk to high energy Celtic, with strains of gypsy and Klezmer. The lads are quickly becoming known for their intense, high-energy shows and dynamic crowd interaction. In just this year alone, Scythian has been booked for eleven festivals including the Milwaukee Irish Fest - the largest Celtic festival in the world. The band headlined the Irish Fair Minnesota with Gaelic Storm and the Potomac Celtic Festival with the Prodigals. Scythian also recently performed at Musikfest which is a nine-day festival in Bethlehem, P.A., that in 2006, drew over one million people. Landing spots in M. Night Shyamalan's The Village and in one of the MTV's The Real World shoots in Philadelphia, Scythian's has secured its spot, according to The Washington Post, "as one of D.C.'s most energetic and eclectic bands. 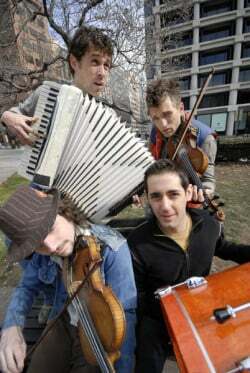 Led by a pair of young raging fiddlers, Scythian brings a passion and energy that makes them unpredictable, spontaneous and contagiously festive." Though they have only been a full-time band for three years, Scythian's love of music came from an early age. The Fedoryka brothers began studying the violin and piano at age three while Crosby and Ounallah began playing the violin and drums, respectively, at age five. The Fedorykas are 100% Ukrainian and come from a musical family with their mother Irene graduating from Juilliard and all ten of the children learning instruments. Crosby and Ounallah bring the Irish blood to the group with Crosby being half Irish and half Austrian and Ounallah being half Irish and half Jordanian. After struggling with the rigidness involved in classical music, Leks lost his passion for the violin. While attending Franciscan University of Steubenville, where his brother Danu and Crosby also attended, one of his friends lured him back to the violin through Celtic music. Once he learned all the songs that he could from a CD, Leks convinced Danu to learn guitar so that he could play along. Danu then suggested that they play the street corners for gas money. Setting up in the streets of Old Town Alexandria, Virginia, the brothers began to explore Celtic and folk music with their childhood friend, Crosby, whose fathers were friends who earned doctorates together. After learning the art and style of stagecraft, Leks spent four months in Ireland in 2002 to learn more about Irish music. Scythian became official two years later and since then the group has played over 350 shows, accumulated an email list of over 8,000 addresses and received over seven million hits on their website. Recently, Scythian was featured on XM Satellite Radio's The Bob Edwards Show and in a Voice of America News story which was aired in the Ukraine, Russia, Poland and various other countries. The band has performed at such prestigious venues as the Kennedy Center, the Strathmore Center and the Nissan Pavilion VIP room. In true "Spinal Tap" fashion, Ounallah is Scythian's newest and seventh drummer who joined "the brotherhood" in March of 2005. He is currently pursuing his master's degree in jazz percussion and theory at the University of Maryland. The lads chose the name Scythian, which is defined as a "bunch of pre-Mesopotamian barbarians who did not use forks or phonics," to describe an essentially nomadic sound that encompasses everything from traditional jigs and reels to contemporary covers. Scythians Immigrant Road Show is an adventure if some hard kicking, infectiously hypnotic fiddling music. Once you start listening you just cant get enough and suddenly you find yourself dancing across the floor, the walls, the furniture and then right out the door to find where the heck are these boys playing so I can get some more! Gypsy Fiddle is just a masterful piece and showcases their classical roots, their street roots and their obvious musical talents. Make no mistake, the sound of these boys is hard rocking  but with the musical genius of their classical background makes for an unbelievable dancing experience. Kesh Jigs is a hard rocking tune and definitely places them in the realm of Celtic Rock. Stonehenge Revisited  a mystical embracing of our Celtic Roots. Technoaccordian will just put a smile on your face with its Celtic Techno sound  and the list just goes on. This is a superb CD, the quality incredible, the talent top notch. 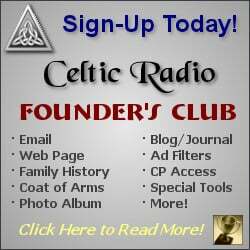 5 Golden Celtic Radio Stars for the Scythian boys!